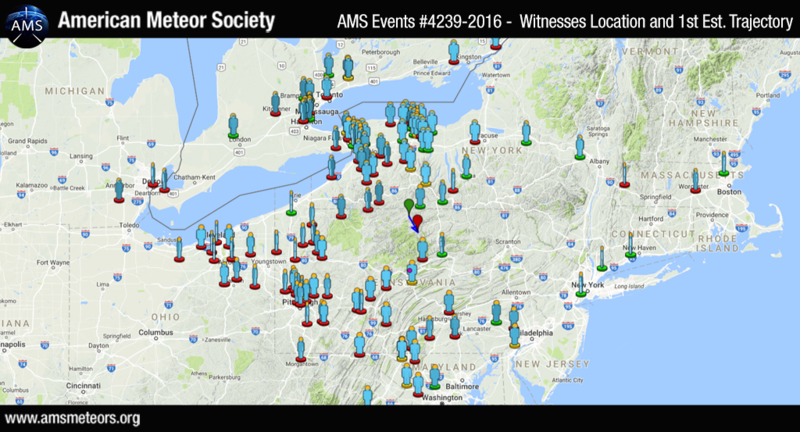 The AMS has received 332 reports so far about of a fireball event over seen over Pennsylvania on November 1st, 2016 around 08:15pm EDT (Nov. 2nd ~ 00:15 UT). 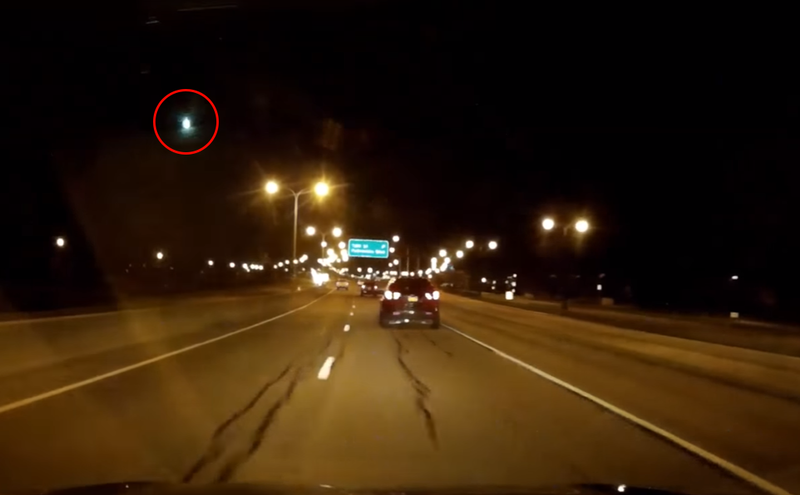 The fireball was seen primarily from Pennsylvania but witnesses from Maryland, New York, Connecticut, Ohio, Virginia, West Virginia, Michigan, Massachusetts, Delaware and Ontario (Canada) also reported the event. Below is the map of the witnesses location with the first estimated trajectory. The preliminary estimated trajectory plotted from the witness reports shows the meteor was traveling from the Northwest to the Southeast and ended its flight near the Pine Creek Valley. I seen this “fireball” last night while traveling eastbound on interstate highway 70 near Hagerstown, MD. Approximately mile marker 20 approaching Hagerstown. I sensed a bright flash of light just out of my peripheral vision to the north while driving. I turned my head just in time to see a bright hazy green yellowish object with a basic circular makeup flash out of sight. Witnessed for no more than 2 seconds not counting what I “sensed” before I set both eyes directly on it. The size of this object or event was grand scale. About the size of 1000 or more shooting stars all clumped together. This is by far the most amazing thing I have ever seen in the sky. I also seen the greenish yellow fireball here in Cockeysville!! I still can not believe ny eyes. This is hand down the best thing I’ve ever witnessed! Thank you! This is a buzz in Ohio as well. I know ones in Trumbull as well as my own county which is Carroll seen it. It was spectacular!!! No, I did not see a fireball on Nov 1, however, I did see one in the evening of Sept 23. I am located in a suburb (Harmar Township) a little northeast of Pittsburgh (about 15 miles from downtown Pgh). Last night around 815 pm I was driving on 81 south near Watertown NY when I saw the “fireball” a bluish greenish moon shaped light was going through the sky Southbound for must have been 3 or 4 seconds. Also had a long tail of green light behind it. It came over my car and I watched it disappear off into the distance south. Lit up the entire sky around it, just an amazing sight to be held. Never seen anything like it. Got the heart racing a bit. Seen this on Tuesday – unbelievable experience. Mine had no trajectory – it almost appeared to have just shot straight down from the sky and land relatively close to me. I’m curious if it was a possible fragment that the bigger meteor left behind because it didn’t appear as big as some of the videos I’m seeing of Bolides. It’s a great shame that there’s no location or orientation given for the video, when it could obviously have been provided. I was driving home from class on US 322 W from Harrisburg, PA up to Halifax, PA when I saw the meteor. Always a sight to behold. I was out running (Exton, Pennsylvania) on Tuesday evening (11/1/16) and at 8:15 p.m. as I was on the “north-bound” section of my route I saw the bright green “fireball” flash downward (mostly, not much arc to its trajectory). It appeared in the north sky below the “handle” (first few stars) of the Big Dipper. After I saw it I looked at my watch to note the time. It was quite a sight and reminded me of a white “fireball” I was lucky enough to see a few years ago when was camping at Worlds End State Park, Pennsylvania. That fireball flashed across the sky (not downward) and it was in the dark of evening so shown quite brightly. I was travelling North on Weaver Ave in Maugansville, MD at approximately 8:10 pm, when I saw a primarily green/yellow ball of light, with a white trail, zipping northward in the night sky. Gone in just a few seconds! Beautiful! I saw it at about 8:14pm ET on 11/1/16. I was headed south on route 65 from Brighton, NY to Honeoye Falls, NY. I had just passed Stone Rd. when I saw it. It was on the east side of 65 and appeared to come straight down instead of traveling diagonally. I couldn’t see a green hue like others said it had. It just looked like a big ball of yellow/white light. It almost looked like a dud firework. Vicki, I live in Irondequoit and I’ve been dying to see a fireball all my life. I missed this one! Maybe next time. Glad you got a chance to see it! I saw it driving west on 32 from 97 in Westminster! That meteor was a once in a life time sighting. From my front yard in Elk County, PA I was lucky enough to be outside to see the streak coming down at a very steep angle, with a slight heading to the east south east, and as it came thru the atmosphere it became such an intense bright white that it lit up the sky around for a very large area to the pale blue color of day, then faded red as it trailed on its heading and disappeared into the black night sky. In my neck of the woods I have seen many meteorites but never one so intense to light up the sky around it, a magnificent event. I saw the huge fireball in ND that night. I’ve never seen anything so magnificent before. I saw the fireball from my tv room window at about 8:15 pm on Nov 1st, 2016. IT came straight down from above. Looked like a comet, bluish green. I hardly believed my eyes! Seemed so close — I waited to hear a crashing sound, but heard nothing. So lucky to have witnessed! Oops! Forgot to note my location.